This was my second attempt at the Marji Gesick 100 and definitely not my last. The course was tougher this year and unseasonably high temps made for a brutal day out on the trail. The report is a little long, so you might have to bookmark the page and come back to finish reading. Enjoy! I still recommend reading through the written report below, along with listening to the podcast as you’re likely to pick up on different things between the two. If you’re planning to do this race, both the written report and the podcast should be good resources for your race planning. Regardless, enjoy and please leave a review in your podcast app and share it with your friends. Thanks! There are barely any flat sections of trail within this course. There is only a few very short flats sections throughout the course and the downhills are not sit back and coast. Many of the downhills will have you out of the saddle and a few off your bike, just like the uphills. There is very few long sustained climbs. They are mostly punchy and many full of rocks and roots. There is about 12,000 feet of climbing and it’s packed into a window of elevation somewhere between a low of around 600 ft and a high of about 1,600 ft. I didn’t completely slow roll it out, but I left the start with what felt like a fairly conservative effort with a plan to stay steady and ease up the pace over time, depending how I felt. You see me write often about going out to hard or setting different goals in a race that might hurt my overal finish goal, but this race plan was to race smart, to finish with the best time possible. I was chasing a buckle, but I also was quite aware that the level of difficulty might have been increased over last year and that buckle might be a stretch. I left the run from a few rows back. Shortly after the start of it, I noticed Jeremiah Bishop running next to me and heard him say he wasn’t ready for that. I don’t hink he was up to the front of the start line when it started. I was running next to him for a short period and then he eventually worked his way forward. I really don’t know what type of placing I was in when I came out of the run. On the bike, I just rode steady, but was passing people on each rolling up hill through the ski trails. I wasn’t pushing the effort, but just carrying my speed up the hills well. I made the descent down the gravel road, to the small opening and then the hard left up into the trails that would begin the climb toward “Top of The World”. I made the climb up, using the little switchback to the right, but found a steady line of hikers going down the other side and jumped off and fell in line. I was relieved… I really want to ride it, but the rocks were wet and I’d rather ride it for the first time when it’s dry and no other riders to dodge. I had some weird knee pain with the hike down that freaked me out. I actually had this come up 2 days earlier when doing some lunges with a client during a training session at the gym. It was painful and I picked my way down the rocks, but never felt the pain again once I got back on the bike. I headed down the trail and it felt like the traffic was thin now. At the end of the rail trail is some nice singletrack that dumped us out on Harlow Lake Rd. This year we were not riding the Angry Bear trail and would take Harlow Lake Rd. to the next trail section. I caught up to the guy that I had seen drop down “Top of The World” and gave him some props for cleaning it. He appreciated the kudos and said that’s what he was here for… Good stuff. The next section of trail was the same from last year and was rooty with lots of little ups and downs. There is nothing there that flows, you work through all of it. Plus it was all wet from the previous day rain. It eventually turns into a long rocky section, which I believe comes prior to dumping out into a little opening. I think this opening is where I remember seeing the guy in a kilt playing bag pipes. I’m assuming Todd had something to do with that. Nice touch! There’s some more tough singletrack that mellows out before bringing you to the bottom of Beagle Rd. that we descended to hit the first section of trail leading to “Top of The World” earlier in the morning. I seemed to be feeling ok, but I wasn’t recovering from the short hard efforts that were required to get up and over some of the little rock sections or rooty little hills. I just felt a little weak afterwards and attributed it to the head cold that was still lingering a bit. I just kept a steady pace up the climb and didn’t push it. I think I went up it slower than last year. Once at the top, we took ski trails back up to Forestville instead of Forestville Rd. The first section of trail, known as Ramblin Man was fast and flowy. I wasn’t in a good flow and rythm though and probably could have ridden through it faster. I was just feeling a little bit off and my head was a little foggy. However, I hit them with no other wheels around me as riders were now getting spread out at this point of the race. Not that I was completely alone, as I could hear riders out in front or behind and also catch a glimpse of them through switchbacks, but nobody was jammed up wheel to wheel at this point. I crossed over Forestville Rd. to hit Wildcat Trail. 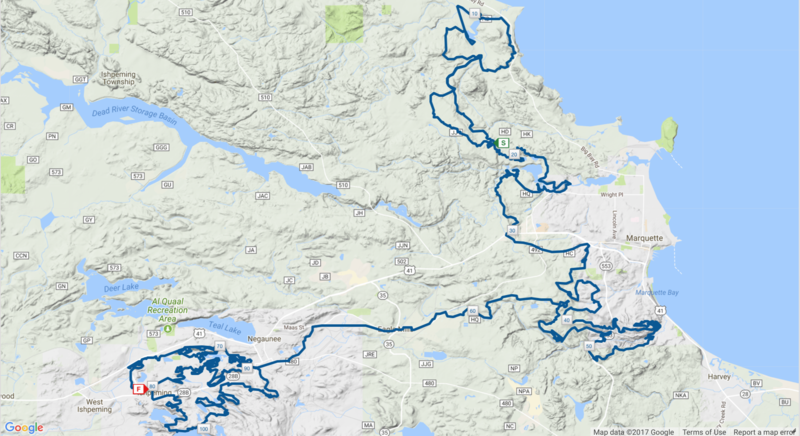 I want to say the first part of it carried the spirit of the previous Ramblin Man Trail, but then got more rocky with really steep punchy climbs the deeper I got into it, that forced me into a couple hike-a-bikes. I came up on another rider at some point that was racing the Marji Gesick for the first time and we started chatting as we were hiking up one of the short steep sections. I remember mentioning to him that this was added section and that the trails were definitely much easier and less technical last year once we came back by Forestville. I also remember coming by a guy sitting out there playing an instrument as well. I can’t remember what he was playing, but I remember him being right near a split in the trail where things were getting tight and rocky. We made some joke together about the rocks, but I could tell he was having a good time watching the riders out there. The trail eventually turns into Pine Knob Trail, but I can’t remember the exact change in trail. I just remember things getting rockier, steeper and more technical. There were also multiple riders fixing flats through this section. This was definitely not a trail to be running lightweight sidewalled tires. There were some really steep technical hike-a-bikes and some really steep, techical and rocky drops that you had to pick your way down. None of them were really long ups and downs, but just constant work. I also remember coming out to a spot that I thought I recognized from a picture that Todd had posted a few days prior, saying something about this is where reality check #1 will set in. He was right… I was starting to think that if this new trail addition was any indication of what changes might be ahead later in the course, that I might be throwing lights on to make to Ishpeming. There was some new trail at the end of this that was actually downhill, fast, flowy and included a few jumps or berms. I almost hit the dirt over one of them when I landed with my front wheel turned a bit. It would take us out to Forestville Rd near the bottom by the railroad tracks, versus crossing at the top onto a ski trail like last year. We had to climb back up Forestville Rd to the gravel road that would take us down to a parking area where Lowe’s Trail would start. I had been riding with Kyle Brierley since leaving the Pine Knob trail and hit the Lowe’s Trail right behind him. He was riding the hills strong, so I just made it my business to stay on his wheel and work up through Lowe’s Trail. Lowe’s Trail is tough old school trail. It’s really much more reminiscent of an old hiking trail than an actual mountain biking trail. It’s work, the entire way with some switchbacks and some real steep punchy climbs. Last year, I had to hike up a couple sections and dab my foot down a couple times. I road every hill in Lowe’s Trail this year and think I only dabbed my foot maybe 1 time. I was definitely riding stronger through this section vs last year. For the last few miles I was feeling the leg cramps coming on and they were now coming on stronger. I’ve been dealing with this in just about every race I’ve done this year, whether I went out hard or conservative. It’s something that I’ve got to get sorted out. Anyways, I ended up downing one of those shots of pickle juice once I came to an opening that I could hit it while I was riding and not have to stop. Lowe’s trail is a pretty busy trail. There was one spot that I think was near a power line opening where there was huge thick mud hole with no other way around it. 25 miles into the race and I had thick soupy mud up past my ankles already. I came by some folks that had a little water station set up and recoginized some of the trail from last year as nearing the end of this section. I knew I was close to the HWY-41 crossing at this point. I found myself weaving through the construction area behind Lowe’s and then found my wife, along with quite a few other SAG folks parked along the side of Lowe’s waiting with bottle and hydration pack hand-ups. I had finished my entire 2L reservoir of CarboRocket and a large bottle of water at this point. That was my plan as well. Whether I needed it or not, I had intended to force the fluids in early since I felt dehydrated going in already with my head cold. I figured I would force the fluids in early to try and stay out in front of the heat driven dehydration, that would come later in the race with the forcasted higher temps on the day. I was about 15 minutes slower in this last section vs the previous year, which now put me about 6 minutes off my overall pace of hitting this same point at the HWY-41 crossing last year. I swapped out my hydration pack for a freshly filled one, or well it was about 2/3s full. I had 2 packs and had prefilled the other one so it was ready for my wife to hand up to me. I knew I didn’t need a full one to get to the South Trailhead, which is why it was at about 2/3s. I grabbed a fresh water bottle, a couple of waffles and another pickle juice shot to throw in my jersey pocket. I crossed HWY-41 through the drainage ditch tunnel and headed up the road to the rail trail. There were still folks parked out like last year with a few offering water, but I had just filled mine up. I felt really good heading down the rail trail after crossing under HWY-41 and the leg cramps seemed to go away. I think I ate another waffle or 2 while at it. I didn’t take it lazy on the rail trail, but I didn’t hammer on it either. I just needed to spin my legs out as there really wasn’t much break again for another 30 miles after this section. This next section of trail was really great riding trail. There is a little connector trail that pops you out on another short road section before really getting into the south trails. There were some folks that had an aid station with water and gatorade set up at the road in front of their house on this short road connector section. I was riding good again and caught 1 rider in the connector trail and then I think another one on the road section. I could tell the rough trail sections at this point were starting to get to people, much like it had myself. The heat was also starting to pick up a bit as well. I think I rode completely solo from that last road section all the way to the South Trailhead. I really like this section of trail. It’s fairly easy riding with a mix of flowy bench cut trail, switchbacks, a few bridges and a couple jump lines. It wraps around the outside of a golf course and then switchbacks over what I believe is an old dump site. I remember the leg cramps coming on again over the old dump site. I can’t quite remember, but I think I did hit a shot of pickle juice again. The trail climbs up what is called Smiley Trail, which is not a bad climb, but not nearly as much fun as going down it. I think Smiley dumped out on a wider path, before going into the more technical and rocky section of the Pioneer Loop that would connect to Eh Line. I was slower through Eh Line this year. I had actually been riding this entire section since the HWY-41 crossing stronger than last year, but my head was still a little cloudy and I took it fairly easy on all the table tops coming down Eh Line. I ended up covering this last section about 7 minutes faster than last year and hit the South Trailhead about 1 minute ahead of when I hit it last year. So, I was still on pace with last years time. But, I would have to pick things up if I wanted a buckle and the heat was definitely starting to set it. I swapped out my hydration pack again with my wife, grabbed a fresh water bottle and another shot of pickle juice to fight help off the cramps that were likely to come back at some point. There was a big aid station here, but I was all set with my wife leap frogging me along the course with fresh supplies. I set out again, knowing that I was heading into a tough section of trail. There was no easy flowy stuff until the bottom of Scary Trail and it would take some work to get there. The first section of trail is what I believe to be known at Blue Loop that dumps into a trail known as Doctors. The first part is rocky, both up and down with some switchbacks. I should have been faster here than last year, but I think I was just as slow as last year. I was feeling weak at this point. My head was foggy and I just didn’t feel good. I walked quite a few little rocky sections as I just wasn’t feeling comfortable. Once to the mostly downhill section that I think is Doctors, I got into a better rythm and starting letting loose a little bit. That downhill section is a lot of fun and steep enough to keep you on your toes for sure. It was a mix of loose stuff, rocks coming up out of the ground and rooty. It was a good idea to try and pick a good line as I think there were definitely some bad lines that could get you in trouble. I eventually popped out onto the Marquette Mountain Rd climb. It’s steep and can have some loose gravel. It’s steep enough in spots that I watched a front wheel drive vehicle start to lose traction on a few spots as it was driving up past me. I was slower on it this year. I could feel the leg cramps coming on again and about halfway up, my legs just locked right up on me. I ended up off my bike and trying to stretch and walk them off. I got back on eventually and slowly finished the climb up to the Scary Trail entrance. The rocks were wet and slippery, but I rode down most of it. I did get off though in a spot or 2 as I just didn’t think it was worth the risk on the wet rocks. It’s really not that bad of a trail and I really didn’t think it was as Scary as I thought it was the previous year. It just has some really steep spots over some rocks without much of a line to follow. This year, they happen to be wet. Which made it a bit more sketchy in my opinion. Somewhere along the way… Peyton Randolph came by on a single-speed and I’ve learned that those single speeders know how to be efficient in the downhills. So, I did my best to stay on his wheel, knowing that I’d make good time down the trail if I did. I was suffering a bit, but I could tell by our exchange of conversation that Peyton was having some fun and truly enjoying the ride. This was good and helpful, as it rubbed off on me a bit and I started to relax and forgot about my fatigue for a short while. We had another rider with us from RBS bike shop, I think by the name of Jay. There were some folks that were coming through Scary back behind us, but I think we ended up putting a bigger gap on them by the time we hit the switchbacks and made it all the way to the bottom. There is short break at the bottom where the trail connects over along the river to the bridge before hitting what I believe is probably one of the toughest sections of climbing on the course. After crossing the river, you still have a little bit of flat trail, but it doesn’t last long. The first uphill is steep and just gets steeper near the top. I’ve rode through here a couple of other times in the past few years on top of the 2 Marji Gesick races, and I’ve never made it all the way up. It’s a little wet, slippery and steep. This is where you start wrapping around the backside of the ski hill. This is also the same spot that really got to me last year with some massive knee pain. This spot hit me again this year like a ton of bricks, but it wasn’t my knee this time. It was the heat now. It was getting hot and there was just no airflow through the trees. Peyton was riding strong and eventually rode off out of sight. Jay was still with me and I think we came up on another rider that was starting to struggle with the heat and the rugged climb around the backside of the ski hill. There was one spot where the trees opened up and I specifically remember it because the wind shot through the opening and I got a few seconds of quick cooling. I almost wanted to stop there for a bit, but kept going. This is where I was really starting to question why I carry a hydration pack as I just couldn’t get rid of any heat off my back. I eventually made it to the top and started the descent down around to the front side of the ski hill where my wife would be waiting for a another hand up. The great thing about the Marji Gesick in comparison to other NUE races that I’ve done is that there are a ton of spots for your SAG folks to access and meet you. Some of the other NUE races that I’ve done can get real remote with very limited road options to get out on course. Plus, many of them do not allow SAG support. My wife doesn’t ride, but her driving SAG for me makes the race something that we’re doing together. Me getting to the finish line is a team effort with me on the bike and her making sure I’ve got what I need. Me crossing the finish line is something that we accomplished together. I took off from the ski hill once I felt like I had cooled off a bit or at least wasn’t overheating anymore. I was also right about the climb out of the South Trails being tougher. I had to get off and walk up over a few sections that on any other normal day, I’m pretty sure I would have climbed right up and over. I started getting hot again right away and my head was in a cloud from the cold still. Around here is when I ran into another single speeder, Joe Stroz. I didn’t catch his name till hours later, but we would ride off and on together for probably the next 5 to 6 hours. Just looking at the elevation profile doesn’t really help you understand the climbing part of it. If you are used to other NUE races, you might be used to really long and huge climbs. It’s only about a 600 foot overall change in elevation from the ski hill to Negaunee, but the elevation gain is over 1,300 feet and a bunch of it comes in short punchy climbs in some of the first trail as you leave the ski hill. I think it was the trail called Off Grade that we took out of the ski hill after crossing under the road next to the river. There is section called Pipe Dream after Off Grade, that I believe must be remenants from the mining days maybe. That’s a total guess, I’m not really sure what it is from. It’s a large pipe that is mostly covered by the ground, but you go downhill on it. It’s fast and fun, but there is one spot where the pipe is exposed with some bolt heads sticking out of it. It might not be the same spot I’m thinking of. Maybe it’s where some trees get close on one side or something. Anyway, you just got a be a little careful, because you mentally want to float to the side, but if you float over too far… you’ll find yourself dropping off the side into the woods and it’s at a point where you’re carrying some speed. After that, I think we dropped out on the Easy Street Trail which was more familiar to me from riding up there in the past. From that point, there was some bermed flowy stuff that was a riot. This entire trail system is actually really amazing. There is so much variety of trail to ride in one location and if you never make it to this race… You still need to get up there to ride. Eventually I came to an atv type trail and knew I was going to drop out on a short road section. This road section is really short before you head left onto a live atv trail. This is that sandy atv trail that you hear people talk about. I had to walk some of it and I think Joe and I had joined back up around this point again. I could feel myself having some hydration issues coming on. I just couldn’t get fluids down. I think they were too warm in my hydration pack and maybe my CarboRocket mixture was to concentrated with the heat. At this point, I just needed some really cold and plain water. There were a couple other riders as well, that had been riding off and on with me. I don’t think at this point we were nessecarily riding together, but more just off and on with the same pace. I actually think the sand was easier to deal with this year as it was a little firmer from the previous day rain. I was close to where I remember the Worst Aid Station run by the Quick Stop Bike Shop in Marquette, being at. I was happy to see them again this year! They filled my bottle with cold water and then diluted my CarboRocket in my hydration pack with more cold water. Even though I wasn’t feeling great, I still grabbed a half a grilled cheese sandwhich just for the heck of it. It went down a little rough, but I was able to get it down with some cold water. To be honest, I regretted that about a half hour later. I never got sick, but could feel it just sitting there and I was still struggling to get my water down. Somewhere along the paved bike trail, there ended up being 4 or 5 of us that joined up and rolled into Negaunee together. They were asking me about timing compared to last year and I knew we were off pace. I told them we’d have to have a heck of loop around Negaunee to get back on track. I knew in my own head that the buckle was most likely gone at this point. I wanted to push, but I was feeling the dehydration at this point and happy to hit my drop bag in Negaunee, where my wife would also be waiting. It ended up taking me about 12 minutes longer to get to Negaunee from the ski hill this year, which now put me about 22 minutes off my pace from the previous year where I had missed the buckle by 25 minutes. Things weren’t looking good at this point, unless I could get things together and have one heck of a ride through the Negaunee Loop. I took a few minutes in Negaunee to figure out what I needed. I slammed some cold Coke, maybe even ate a few Pringles. I can’t remember now. I also grabbed a fresh water bottle, but instead of grabbing a fresh hydration pack… I topped off the watered down one that I already had with the full mix that was in the new one that my wife had ready. I was worried that I had mixed it a little heavy and combined with the heat, it was making it a little harder to get down. We of course still had to ride up the short flight of stairs that was only 10 feet over from a perfectly ridable trail. This is very early in the loop, where the course weaves through old roads from what must have been left from an older mining town or mining property. We also rode down a couple flights of stairs where both Joe and I lost our water bottles and had to stop and pick them up. After riding down the flight of stairs, the course would take us out on a 2 track type of trail toward an old fence line. I remember the fence line from both this race and the Polar Roll. There is a climb up along the fence line and I’ve ridden through here a few times, summer and winter. It’s usually not a problem, but I could feel the cramps coming on as I worked my way up it and decided to hike the rest. I also remember the fence line on the north side of the trail system, much like the old rail line (at least I think it is an old rail line) on the south side of the trails. Anyways, It’s nice and fairly easy riding until you turn south inside the fence line or turn off the old rail line and then things get twisty, punchy and many times… rocky and rooty. There is one spot in the trail that is a really narrow and rocky benchcut that twists around an edge. I think it’s built around a massive pile of rocks that were pulled out of the ground during the mining days. With my fatigue, I actually unclipped my inside foot while I rolled around one of the edges. The pace was getting really slow, only a few miles into the Negaunee loop. I would ride on and off with Joe for much of the Negaunee loop. It seemed like when one of us started to waiver, the other would keep a little push going, which kept the other guy moving. We were both aware of the clock ticking down on the buckle and mentally going into a bit of race survival mode to make sure we finished this thing up, at least that’s where I was at. I was struggling with hydration. I just had a hard time taking in fluids. I started feeling like I was going to get sick if I drank too much. I had to dial it right back and walk more climbs than I wanted, in an attempt to avoid letting the heat completely obliterate me. The leg cramps were also completely unavoidable at this point with any mild effort. I’ll admit, there were a few moments where the fear of having to text #QUITTER, kept me in the game. I wasn’t going to do it and would walk every hill from here on out to avoid sending that text message if needed. I knew I couldn’t stop drinking all together or my day would end whether I wanted it to or not. I forced small sips of water in. I couldn’t get large amounts of fluids down, but continued forcing in small sips out of my bottle every time I got off to push my bike up a hill or over a rock. When riding, I just kept forcing in small sips from my hydration pack. Too frequent and big of sips, or to hard of efforts would make me feel like my stomach was going to turn over, so I just dialed the efforts right back for awhile and focused on forcing fluids in a little bit at a time. The buckle was gone, but I could still finish if I played things right. I actually finished my bottle and came across somebody handing out water that filled my bottle up when I came out to one of the street crossings in town. The water was cold and much easier to get down. I think this must have been at the North 3rd St crossing in Ishpeming. You have to weave through a couple city streets and then hit a trail around the outside of a ball field that puts you into the next section of singletrack. It’s really impressive actually, how these trails have all been laid out to get so much singletrack packed into the available land. Within this section of trail, there is a really steep switchback climb. It comes up shortly after coming up alongside of a railroad. The trail turns south and then starts switchbacking uphill and the climb continues up a ridgeline. I walked most of it. I think Joe and I caught back up together somewhere around here or shortly after and where we came to a fork in the trail with no arrow… To the right looked easier and to the left looked harder. It was hike-a-bike to the left, at least in my current condition of my withered body and fatigue. We stopped quickly to make a decision of which way to go and I remember saying something like… “It looks harder to the left, so that’s probably the correct way”. As it turned out, it was just an A and B line that joined back up shortly after. I came out at another road crossing, Lakeshore Dr and then into some short two track type of trails that would eventually get me over to the bike path in Negaunee. This is where you get the teaser of being near the finish line, but still have another 25 miles to go. I believe it was that atv trail prior to this, where I came up on somebody offering out handfuls of ice. I took the ice and ended up just dropping it down the front of my bibs. I thought it would help cool down my core as I was still struggling to fight off the heat. I also found another water bottle hand up somewhere around here also. I can’t remember if it was before the passing by the finishing line in Negaunee or after. I want to say it was after. Anway, I came up on somebody the was driving SAG for the LCR crew and she filled my water bottle up for me. Consistantly forcing the small sips of water in was working and I was getting hydrated again. I came into another area of singletrack that of course weaves uphill. I can’t remember what the trail was like, but I’m sure it was rocky and rooty… It was a shorter section of trail and then I popped out on the snowmobile trail for just a short distance to a dead end road that lead us back into the trail system. It started with a loose gravel uphill that came out by a water tower. I walked part of the hill and came upon Starr from the Woolly Bike Club and CyclovaXC, who was conquering the 50+ mile run. The chain of events start getting a little blurry from here to Negaunee. Even when I look at my gps route, I still have a hard time remembering where specific trail sections were at. I remember some sweet flowy singletrack at some point though, but also some really steep rocky stuff. There was one point that I know was an addition from last year that took you through what I remember as being what I might consider a rock gauntlet. I also remember some other steep rocky downhill that I walked down and then turned around to see Joe clean the entire thing. I remember Kyle Brierley coming back by me somewhere as well. He sounded happy and looked like he was riding strong. I believe it might have actually been his parents that gave me some water also. I remember it being cold and was a huge help. My hydration status was getting better and it was getting easier to get the fluids down, especially the cold water. I was able to get a lot more of my CarboRocket down as well between the cold water hand ups. I had slowed my pace down dramatically the last couple of hours, but it was paying off and I was actually starting to look forward to eating something solid once I hit Negaunee. I remember crossing a street, must have been Michigan St, and thinking as I hit the trail on the other side that I recognized where I was at and knew we were getting really close to Jackson Park. I recognized a left hand turn away from a rocky outcrop onto some narrow rocky benchcut that switchbacked to the right again. This would dump out onto the atv trail that headed down toward Jackson Park. Except this year, we turned off of it to the left before going all the way to the bike path. This would loop out onto a couple of those old mining city streets and loop us back directly through Jackson Park. I rode into Jackson Park well off my pace from last year. It took me a little over an hour longer to complete the Negaunee Loop this year versus last. I was now a little over an hour and a half off my pace from last year and the buckle cutoff was only 30 minutes away with nightfall not far off. I was headed out now for my last section of the course, but knew these last 15 miles were going to chew up some time and I would soon be turning those lights on. I headed into that little section of woods that connected to another street that went uphill before hitting the the trails for real. I don’t remember what it was like at first, but then I remember dropping off of a rail trail into some downhill flowy stuff. I remembered this section from last year. Shortly after this section is where you hit the first steep hill that just when you think is about to end… you’re actually only about halfway up it as it continues up through a bunch of switchbacks. The trails here are actually really great and I need to get back up there and ride them when I am fresh sometime, versus after already being on the bike for 12 hours. I came out to a gravel road, where to my suprise my wife was waiting with another bottle handup. I hadn’t finished my other one completely yet, but swapped bottles and kept moving. She had looked at the map and figured she could catch me at a couple of the places just to check on me. I think she was a bit worried about me as the sun was setting and my comment about not knowing how things were going to go as I left Jackson Park. There was also a group of local folks out there following the race and waiting for some other racers. This was just a short section of road and then I would dive back into the woods for another singletrack climb. I think I had my lights on by now. I delayed turning them on as long as I could because I find it hard for my eyes to adjust with light while there is still a little bit of natural light in the sky. The trail would pop back out on that same road again, but a little further up is where my wife happen to be waiting again. I can’t remember if I grabbed another bottle or not at this point. I think I swapped bottles a couple times, but really never emptied any of them. It was nice though to have the option and security of a full bottle in case I got myself into trouble. I was back in the woods again and I’m sure it was dark by this time. I remember hiking up some switchbacks and I could see headlights from other riders off in the distance out in front of me and out behind me. I came out on the gravel road again and could see what looked like my truck parked up ahead, but the trail took me into the woods along side the road. It was pitch dark by now and my wife would have had no idea if that was me or not, so I yelled out to let her know it was me and I was ok. I really can’t remember what this next section of trail was like. I don’t think the climbing was bad on it, but most of the singletrack in the last 15 miles is rooty and rough. There are a few really steep spots in them as well. I don’t want to call them drops, because you don’t drop off them. You ride down them, hanging off the back of your bike to avoid going over the bars while wishing you would have bucked up for a dropper post. Again, I can’t remember the exact order of all this… So some of what I just mentioned might actually be slightly later in the trail. There is a spot where you come to some opening and the trail cuts around the edge of a lake. You have to get wet and you get a little suspiscious if that is infact the right way to go. I came up on it this year to find another rider kind of looking at it in disbelief, thinking that could not possibly be the right way. I gave him a nod and said “yep, that’s the right way”. I think the edge of that lake was a little deeper this year. I thought I was able to ride across it last year, but I just picked my bike up this year and walked across it as I think it might have been hub deep this year. There was a slight downhill grade along a rode for a very short period, but then I took a right up around a gate to start grinding out another climb. About halfway through the climb I came near the bottom of the old ski jump. Lessons from the past 13 hours dicated that there was obviously more opportunity for pain if you’re at the “bottom” of a ski jump and the climbing continued toward the top. I struggled with the switchback climbs up through the woods from pure fatigue, but I was not getting the cramps anymore like I had earlier, or pretty much the entire ride up till this point. It was just pure fatigued, but without the cramps, I was able to grind out some of the atv/gravel climbs. Not the stupid steep ones that you felt like you needed climbing gear for, but the milder ones. When I say climbing gear, I am actually referring to ropes, harnesses and actual rock climbing gear. I eventually came to the one that stands out amongst the rest of them to find a few other people going up it and a few others coming up behind me. It was a little backed up to the right and a few of us worked up the left side of it. I seriously remember the guy in front of me getting up it and literally dragging his bike up behind him. I grabbed a tree with my left hand and managed to pull my bike up past me with my right hand. I was able to get some footing again and find another tree on the left to hang on to and get myself up over the top while pulling my bike up behind me. I think it was an easier route to the right, but was backed up with a few people. I remember hearing vocals from both ends of the spectrum… There was a lot of cussing at one end and just pure giggling at the other. I think I might have been somewhere in the middle, but the giggling of disbelief from a couple of the other folks made me laugh. I remember getting over the top of it and still laughing about the situation, which brought my spirits up and gave me a bit of energy. I guess we all need to laugh more often because I got on my bike and starting picking up the pace and riding stronger. I also knew I was only a few miles from the finish at this point and wanted to finish strong. I was going to finish with my head up, regardless of the beating I had taken throughout the day. I think I ended up riding away from most of that group that I was with over the next mile or 2. I was ready to get this thing wrapped up. I also love the finish of races. Sometimes, because I’m ready for the suffering and the pain to end… but also because I think I get a little emotional about some of these crazy sufferfest races and the accomplishment that comes along with just finishing them, even if you miss your time goal. It’s hard to explain, but I know there are folks out there that know what I’m talking about. Anyways, I remember flying downhill through a wider atv type trail with my light out in front of me, thinking about how cool it was to race the last couple hours in the dark and actually make it. Without the race going on, I wouldn’t have had that same experience. Sure, I could experience the ride part… but I would be missing out on the emotional part of the ride. Which, in my opinion plays a much bigger part in the overall experience and completely changes the experience in itself. I was coming down some kind of semi-rutted atv section and recognized it from the Polar Roll last year. We went up it in the Polar Roll, but I knew I was very close to coming out to the trailhead where the Polar Roll entered the trails at. I hit the old town streets and found the trail to Jasper. I was curious what I would find at the top as I saw the sign about there being a message up there. I made it up there to find a few folks cheering me on as they read the sign with me. I can’t remember exactly what it said, but it said something about being on the largest exposed gemstone in the world. I dropped back down the singletrack to exit Jasper and hit the streets of Ishpeming, with just one little atv trail section left. I made the right hand turn to head to the finish line and then made a sprint for the finish after crossing through the road barriers. I was by myself, but sprinting to the finish line was my way of getting back up again after being repeatedly knocked down through many hours of suffering. It actually only took me about 9 minutes longer to finish that last section in the dark vs the previous year. I ended up crossing the finish line of the 2017 Marji Gesick 100 in 14 hours and 5 minutes to finish 23rd in the overall. This was about 1 hour and 40 minutes slower than the previous year, but actually 2 places better than the previous year. Needless to say… I’ll be back next year and my registration will be put in on this coming Friday. This race made me a better rider this year. Having this race out in front of me, made me take some chances in other races to learn and sort things out. It made me tackle some more singletrack racing early in the year to work on my singletrack skills. It got me into a couple other 100 mile races leading up to it to get me better prepared, where I experienced some rocks and narly downhills. It also kept me focused on keeping my core strong as I knew I couldn’t make it through the Marji if I let my core go. I actually finished the Marji this year with no back or shoulder pain, just massive amounts of fatigue. Race reports for races like this one always seem hard to wrap up as I want to continue to reflect on it, but as I look at at the bottom of the page, I’m approaching a 9,000 word count and should probably shut things down. Get registered and I’ll see you up there next year! I know there are a bunch of other race reports out there for this year. I haven’t read them yet, but will get caught up on them now that I’ve got my report written and I’ll get links to all of them listed here as I go through them. Thanks Scott! If you’re thinking about doing this one, you better get in now. There was only a few spots left the last I looked. Might even be sold out now. Reg opened up yesterday. Congratulations ! I’m in for next year. May I ask where would you stay if you were alone ? Marquette or Ishpeming ? Thanks. Awesome Jerome! I’d suggest Marquette. There are quite a few hotels within about 5 miles of the start line along HWY 41 in Marquette. Hey Steve, any chance you could do a gear overview of what you used, worked and didn’t ? Do I need all-mountain/enduro tires or big volume XC tires will do ? that sort of thing. I know you have a video on youtube from last year. Sure thing. I keep wanting to add a section at the bottom of my race reports or now at the end of the podcast for both a gear and nutrition review of each race. It’s more of a time constraint by the time I get the report done sometimes. But, yeh I think that would be a helpful one. I was thinking that I might just do a full roll up at the end of the year that covers my gear and nutrition goods and bads for the year and then touch on how I’d change for each race I did, so you could get it for a bunch of races all in one episode. Could make sense also for me to just have a guest on at some point and have them question me about all that stuff… Interested…? 🙂 Stay tuned actually for some guest episodes. I just finished up recording my first guest episode for the podcast. That being said, I ran Conti X-Kings. 2.4 in the front and 2.2 in the back. I use the Protection version and run it tubeless. Been running them for the last couple years on all kinds of terrain and never had a flat. I don’t think you need a heavy trail or enduro tire at all, just a solid XC tire with good sidewalls. Stay away from the lightweights. That would be my opinion. I really need to experiment with some other tires though as I think I could do a little better in the front for cornering traction. They are rounded versus a more squared edge and have good traction, but I just can’t really feel when I’m on the edge and about to start slipping, which makes me a little skiddish. Might not be the tire, but more my confidence in the corner. My fork angle is pretty steep also compared to the modern geometry the last couple years and some of it could be the steep fork angle and just being on a more twitchy handling bike. Great info, thanks for sharing. I’d be interested to be a guess. I would have many questions to ask regarding many aspects of racing hundies, strategies for the MG100 for sure and the Shenandoah 100 also, training, gear selection, etc. Let me know we could have a chat over skype one day.